Prices range from US$229 for the N23 and go up to $349 for the N24. The two convertible models are designed for schools and business environments. Microsoft launched their Surface notebooks and the Windows 10 S in order to provide an alternative to Google’s Chromebooks that have been dominating the education market for some years now. Microsoft is now allowing OEMs to integrate the Windows 10 S with convertible notebooks of their own, through the “Back to School Live” program. 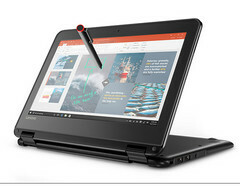 Lenovo is the first to offer the low-cost N23 and N24 models. These will soon be joined by more models from Asus, Dell, Fujitsu and HP. The N23 and N24 notebooks are designed for schools and business environments. Prices range from US$229 for the N23 and go up to $349 for the N24.